"Boric Acid Tin - 1" by Normadeane Armstrong Ph.D, A.N.P. This is a 2 oz. 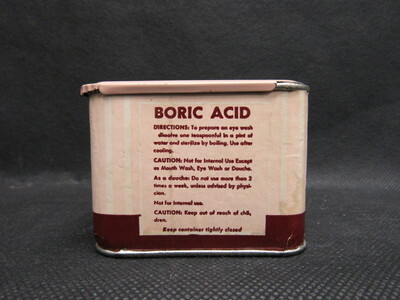 tin of Boric Acid produced by Purepac corporation located in Elizabeth, New Jersey and Los Angeles, California. The package features a faded pink and white striped wrapper with a brown board around the base.